M.E. awareness week is all about raising the profile of M.E/CFS and letting the world know that it is a real and physical illness affecting millions globally. It is the ideal time for the many people around the country to come together, those who suffer form the illness and the their caregivers, to ensure as many people are told out M.E. as possible, and the thousands of sufferers are not forgotten just because they or their symptoms cannot be seen. M.E. Awareness week will take place from Monday the 7th to Sunday 13th of May 2018. The week of events and awareness raising will centre around M.E. Awareness Day, a global event to highlight the illness and the many it affects, and is held annually on the 12th of May. The day’s origins are founded around the birthday of Florence Nightingale, who was said to have suffered from M.E. and was born on May 12th. What will we be doing/? The Shropshire ME Group will taking part in #MillionsMissing in Birmingham on Friday 11th of May. For further details about this event please read more here. 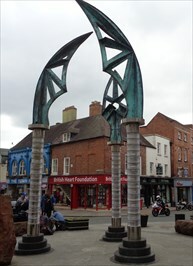 On Saturday 12th of May we will be raising awareness in Shrewsbury Town Centre at the Darwin Gate Sculpture, between Mardol Street and Pride Hill. Our volunteers will be on hand to give details about our group, M.E. and its symptoms, and how you can support someone with M.E. We hope you will come and say hi. Saturday 12th of May will also see a scrolling banner on display at the Theatre Severn in Shrewsbury. Messages will be displayed in blue, the colour associated with M.E. Awareness Day, and will be shown in a variety of languages to highlight that M.E. is a global issue affecting millions.